Award & Scholarship : 1. COE (Center of Excellent) Fellowship for pursuing doctoral study in Kyoto University, Japan. Academic Activity at EEE Dept. : 1. Coordinator, Committee of Innovation, Industry Linkage & Technopreneurship. 2. Coordinator, Committee of Laboratory, Class Room & Electronic Teaching Resources. Previous Employment : 1. 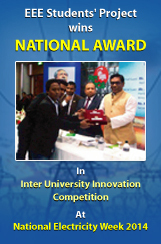 Assistant Professor (2004–2010), Department of Electrical and Electronic Engineering, Independent University, Bangladesh.